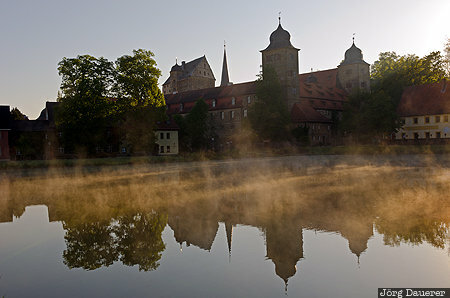 The back-lit Castle of Thurnau behind the castle pond and morning mist. Thurnau is in Upper Franconia (Oberfranken) in the north of Bavaria, Germany. This photo was taken in the morning of a sunny day in May of 2014. This photo is part of the exhibition Urban Fog (October 2018). This photo was taken with a digital camera.